I love guacamole, but I've never made it completely from scratch before so I thought I'd give it a try. 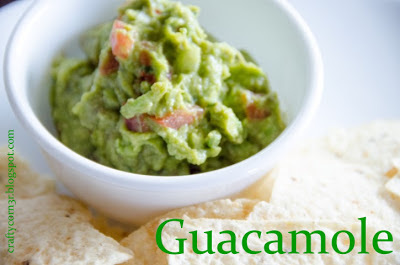 I decided to try Alton Brown's guacamole recipe because it got such rave reviews. 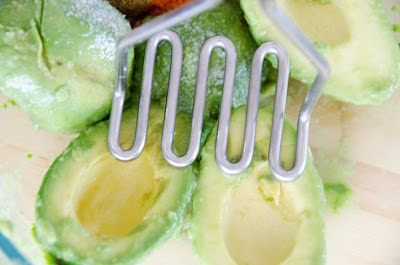 In a large bowl place the scooped avocado pulp and lime juice, toss to coat. 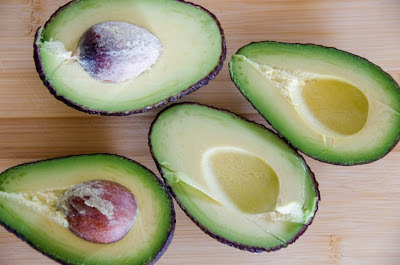 Drain, and reserve the lime juice, after all of the avocados have been coated. Using a potato masher add the salt, cumin, and cayenne and mash. 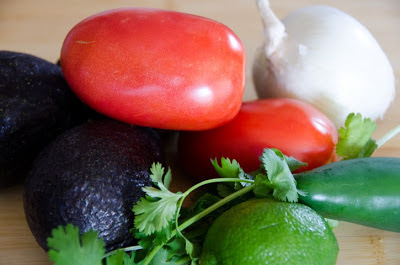 Then, fold in the onions, jalapeno, tomatoes, cilantro, and garlic. Add 1 tablespoon of the reserved lime juice. Let sit at room temperature for 1 hour and then serve. What's the verdict? It was SO delicious. I am a wimp when it comes to spicy foods so I only used 1/4 of a jalapeno, and 1/4 tsp of cayenne. It wasn't spicy at all and it was really chip licking good. This recipe is definitely a keeper and one that I know I will make again and again.